This is the waterer you want for tough environments. 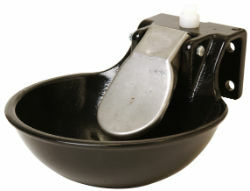 Made of heavy-duty cast iron with a tough, nontoxic black epoxy finish for corrosion resistance. Works great for horses, cattle, and hogs. Livestock press the heavy-gauge stainless-steel push paddle with their noses to release fresh water. (Most animals readily learn to operate this type of waterer.) When the animal releases the push paddle, the non-siphoning water valve drains water and shuts off the supply so there is nothing left in the bowl to freeze in winter or breed disease-carrying organisms in summer. Safely operates between 20 and 50 pounds per square inch pressure. Mounting plates are included but other mounting and water connection hardware are not included.